11 April 2017, at 6:00a.m. Greater affluence across India is driving an unprecedented growth in demand for animal protein. A Nair investigates the role of antibiotics in this boom for the Indian poultry industry. Supplying 5.1 per cent of the world’s total egg production, India is the third-largest egg producer on the planet – after the US and China. 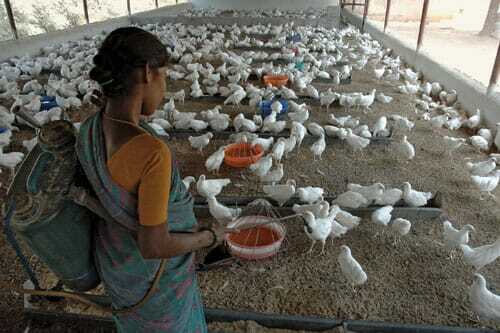 India is also the fourth-largest chicken producer after China, Brazil and USA. It’s perhaps no surprise, then, that poultry is the most organised sector in Indian animal agriculture. Within a span of 25 years, egg production has soared to 70 billion a year from a few millions, and broiler production has now reached 3.8 million tonnes annually. And the rate of growth has been steady. India has notched up an increase in the production at a rate of 8-10 per cent per annum in eggs, and 12-15 per cent in the broiler industry, according to data from the Agricultural and Processed Food Products Export Development Authority (APEDA). However, recent studies conducted across India have discovered antimicrobial residues in food such as chicken meat and milk, as well as resistant strains of bacteria such as Staphylococcus aureus (which can cause skin infections and food poisoning), enterococci (a cause of urinary tract infections), E. coli, Pasteurellamultocida (which causes avian cholera in poultry flocks), Campylobacter (one of the most common causes of food poisoning in humans) and Salmonella. A report published last November by researchers from the University of Hyderabad also found multiple-drug-resistant Helicobacter pullorum bacteria in samples of chicken. In addition, bacteria strains have been found that produce enzymes known as extended spectrum beta-lactamases (ESBL) – such bacteria are resistant to some of the most common antibiotics, and their presence indicates that antibiotic use in food animal production is widespread. Since many of the antibiotics commonly given to animals are the same as those used to treat human infections, many are concerned about how their use in farming is depleting their effectiveness at the expense of human health. India is also one of the biggest consumers of agricultural antibiotics worldwide, accounting for 3 per cent of global consumption. By 2030, this use is estimated to double. DrSiddharthGautam of the National Institute ofHigh Security Animal Diseases in Bhopal, Madhya Pradesh, says rising incomes and a growing population are driving protein demand in India, and this has resulted in intensive farming. He adds that in order to stay competitive, producers are relying on antibiotics as a stopgap measure rather than improving hygiene and sanitation in large-scale operations. Often, they are administered not just to treat or prevent diseases in crowded or unsanitary conditions, but also at sub-therapeutic doses as growth promoters. Though antibiotics are helping to sustain intensive food production, the spotlight has turned on their uncontrolled use on farms. In India, there are no standards for tolerance of antibiotic residues in poultry, although such standards do exist for seafood. DrGautam adds that though the indiscriminate use of antibiotics in poultry is a serious concern, there is no law yet to regulate their use. Only two advisory regulations issued by the Food Safety and Standards Authority of India exist, which restrict the use of antibiotics in feed and feed supplements. While these notices are intended as the basis for enforceable mandates, the rules are currently only at the draft stage. Dr S Venkatesh of the National Centre for Disease Control, which is part of the Ministry of Health and Family Welfare, notes that repeated and prolonged exposure to antibiotics in animals would lead to the emergence of resistant strains of bacteria, and that these resistant strains would be passed on to the humans who consume them. Venkatesh also holds the view that the usage of antibiotics in the veterinary sector is unregulated. This threat to public health has led to some action from the Indian authorities. A public awareness campaign to highlight the dangers of antibiotics misuse was launched by India’s Ministry of Health and Family Welfare in mid-2016. Though initially directed at the overuse of antibiotic treatments for humans, the campaign seeks to reduce the need for antibiotics in general, promoting less frequent use and better antibiotic targeting, and the elimination of antibiotic use for growth promotion in farming. Dr Venkatesh adds that India is late in recognising the critical role of antibiotic use in animals plays in promoting resistance, considering the steps that have already been taken in other regions such as the EU and US. “As European countries have banned certain usages of antibiotics, India is looking to take similar steps. An inter-sectoral co-ordination committee – which will review data, undertake studies, specify antibiotics for use in livestock, review laws from other countries and evaluate their applicability in India – has been mandated to specify recommendations,” he adds. The committee will look to outlaw veterinary use of those antibiotics deemed to be most important for human health, ban the use of antibiotics for non-therapeutic purposes, particularly growth promotion, and require withdrawal periods between the use of antibiotics and animal slaughter. Once adopted in India, such a set of regulations would go a long way towards reducing the use of antibiotics in animals without harming their health or endangering humans.